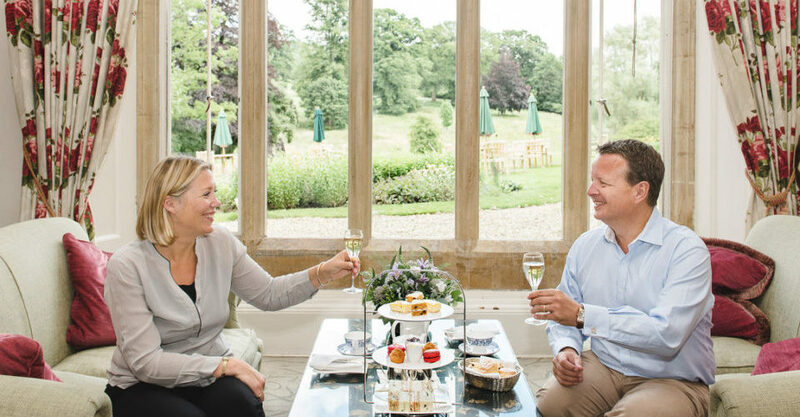 This summer, enjoy a luxury afternoon tea in the Cotswolds and a classic glass of Pimms with our compliments! Experience a wonderful afternoon tea from a Michelin-Starred kitchen at Lords of the Manor from Monday to Thursday throughout May, June, July and August and enjoy an ice cold glass of Pimms on us. Spend an afternoon catching up with friends or family at one of the finest luxury hotels in the Cotswolds. Enjoy your afternoon tea in one of our beautifully bloomed gardens or settle in the lounge or bar and enjoy the countryside views. Our classically English afternoon tea consists of a selection of finger sandwiches, two freshly baked scones with clotted cream and strawberry preserve, a tempting selection of pastries and cakes, all served with your choice of tea of coffee. Make most of the day by taking a walk around our 8 acres of gardens and lawns. Another popular way to enjoy a walk is to park in Upper Slaughter and follow the Warden’s Way path down to Lower Slaughter (pick up a map from our Reception). By common consent, it’s one of the most beautiful of all Cotswold short walks – the road leading back to Lower Slaughter was even named the most ‘Romantic in Britain’ in a Google Street View poll. The circular walk takes an hour or so – and you’ll be in the perfect mood for Afternoon Tea upon your return.